When Lady Katherine’s father is killed for being an illegally practicing Catholic, she discovers treason wasn’t the only secret he’s been hiding: he was also involved in a murder plot against the reigning Queen Elizabeth I. 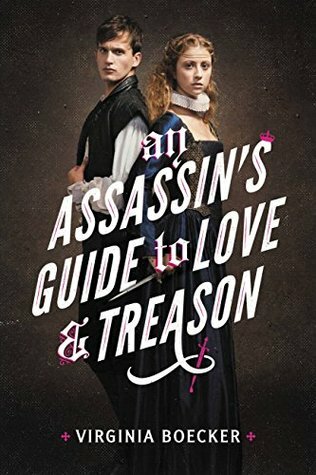 With nothing left to lose, Katherine disguises herself as a boy and travels to London to fulfill her father’s mission, and to take it one step further–kill the queen herself. Katherine’s opportunity comes in the form of William Shakespeare’s newest play, which is to be performed in front of Her Majesty. But what she doesn’t know is that the play is not just a play. It’s a plot to root out insurrectionists and destroy the rebellion once and for all. Two years ago, I read the first book in the author’s fantasy series – The Witch Hunter – and, surprisingly, I rated it 3.5 stars as well. What does this mean? Well, like The Witch Hunter, this one was easy to read and fast-paced. I enjoyed reading about the two main characters, two people who both have distinct personalities and back-stories that help us understand where they’re coming from. The concept is also original. Who has ever heard of putting on a play to kill a king or queen? This was the first time I heard of it, and I certainly do wonder now what else the author is going to come up with in the future. Surely it’ll be an astonishing idea as well. But although it is unique and not at all a chore to read, there was something missing, the same thing that, if I remember correctly, was missing in The Witch Hunter too. The reason for my inability to give it four stars or more. And that thing is… seriousness. Somehow, I couldn’t feel the danger. Both Katherine and Toby step into trouble at different points in the novel, and yet I was already imaging how they would step out of it. In my mind, it was never a question of whether they would get hurt or not—the tone of the story didn’t make me believe any scene was a matter of life and death. As it happens, I also thought it became repetitive after a while, and to create the illusion that it isn’t, in fact, repetitive, the author weaved these romantic scenes that sometimes make it feel as though we’re not reading about an assassination plan anymore but about two star-crossed lovers. That’s not necessarily a bad thing. If you enjoy romance in your Historical Fiction reads and are excited by the idea of a woman dressing as a man and experiencing the world like never before, this is right up your alley. All I’m saying is I did notice the repetition and find that the author could have added more action scenes to the plot and seriousness to the tone. But once again, it reads quite well and the characters are three-dimensional. The story is original and entertaining and I genuinely wanted this to become a series at some point and I only wish that for stories with characters I don’t want to immediately say farewell to. This sounds very unique – too bad you didn’t feel the danger the characters were dealing with! It could be so very good if that had happened.